Swimming with Dolphins - Coach & Grow R.I.C.H. Adam and I just returned from a week in Hawaii. He was there for work so I decided to join him (not a tough decision). I have to say, I really like having a husband who travels to Hawaii for work and feel very fortunate that I have the ability and flexibility to join him. While Adam was working on Oahu, I spent a few days on the Big Island with my dear friend Summer. 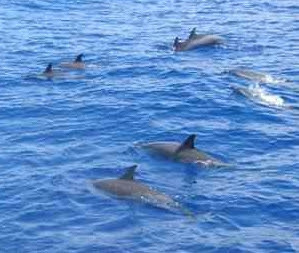 We took a whale/dolphin watching trip out of Kona with Captain Douglas, who has a wonderful “coach-like approach” about connecting with the animals. No whales, but we saw several large dolphin pods and got in the water to swim with them three times – it was amazing! If you find yourself in Kona, Hawaii, this is a great way to spend the day. I didn’t take many pictures, but this one came out pretty good.